Doggles dog goggles are designed to protect dog's eyes from the sun's harmful rays, flying debris, wind, rocks, or bugs. Your dog can't tell you his eyes hurt, so be proactive and help protect his eyes with these rugged dog goggles. The lenses are 100% UV protection, shatterproof, and anti-fog. The frames are made of rubber and are super flexible. The deep lens cup keeps the lens away from the eye, preventing potentially dangerous rubbing or hitting of the eye. Doggles are worn by working dogs all over the world such as K9 Units, Border Patrol dogs, and Search & Rescue dogs. 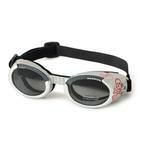 These ILS goggles have interchangeable lenses! Dogs need UV protection just as humans do, and if your dog is out and about with you, your dog should be wearing Doggles eyewear to protect his eyes from harmful UV rays! 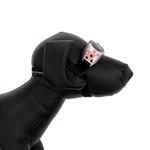 Doggles are designed just for dogs with a deeper lens cup (because dogs have protruding eyes), wide nose bridge (because dogs have really big noses), foam padding around the entire frame, and soft adjustable head and chin straps. Doggles also come recommended by Vet Ophthalmologists to protect their patients in all types of situations and also after some types of eye surgery. And don't forget that these Silver Skull Frame with Light Smoke Lens Doggles are in the height of rebel dog fashion! The frame is the measurement from one corner of the frame to the other (outside corner of the eye to the outside corner of the eye across the face). The longest strap measurement is length fully stretched. Please keep in mind that breeds vary by size and that the breeds above are examples, you should go by the size and weight of your dog. The weight and frame measurements are the most important measurements. If you have any questions regarding size, please call customer service and they will be happy to assist you. Doggles - ILS2 Silver Skull Frame with Light Smoke Lens Customer Photos - Send us your photo! Slater, sporting his Silver Skull Doggles, bringing smiles to cancer kids.